Inside Chicago Health Guide: Resources for the Uninsured and Underinsured, residents will find a complete listing of health care resources, providing contact information and health tips in an easy-to-use and easy-to-read format in English and Spanish. 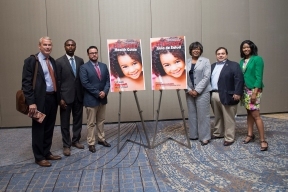 The guide, which is free to residents, will be available to the public via the United Way of Metropolitan Chicago office, community health centers, as well as several community-based organizations. Residents may also call 1-888-720-1337 toll-free. “We are proud to sponsor the new Chicago Health Guide,” said Kate Walsh, Regional Business Director at Pfizer. “Pfizer has been helping patients gain access to the Pfizer medicines they need for more than 25 years, and recently the company has stepped up that effort by doubling the allowable income level for its patient assistance program. Unfortunately, patients still face many ongoing challenges in paying their medical out-of-pocket costs or accessing medical care. We hope that this guide can facilitate that access for those in need.” The publication was made possible with the help of NAHN, United Way of Metropolitan Chicago, the National Black Nurses Association (NBNA), and Pfizer RxPathways.